OTTAWA — The Ottawa Senators defeated the Boston Bruins 4-2 at Canadian Tire Centre on Monday to increase their lead on Boston for second place in the Atlantic Division to four points. 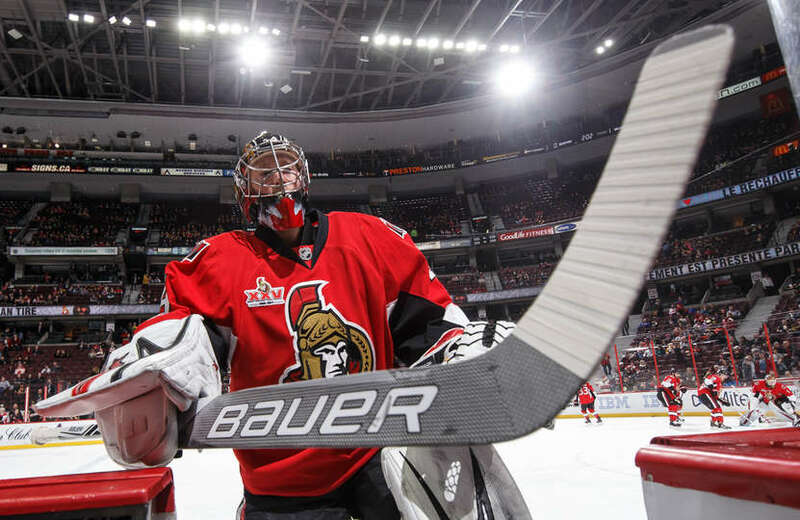 Derick Brassard, Jean-Gabriel Pageau, Mike Hoffman and Alexandre Burrows scored for Ottawa (36-22-6), and Craig Anderson made 25 saves to help the Senators win their third straight game. Patrice Bergeron and Brad Marchand scored for the Bruins (34-26-6), and Tuukka Rask made 25 saves. Boston is 8-3-0 since Bruce Cassidy replaced Claude Julien as coach Feb. 7. The Senators have two games in hand on the Bruins. After Boston’s David Pastrnak was penalized for high sticking at 7:36 of the third period, Hoffman scored his 20th goal on a shot from the left point through a screen to put Ottawa ahead 3-1 at 7:50. Marchand scored his 30th goal to make it 3-2 1:14 later, also on the power play, when a shot by Pastrnak into a crowd in front bounced to an uncovered Marchand at the left post. Burrows scored into an empty net with 50 seconds remaining to make it 4-2. It was his third goal in three games with Ottawa since being acquired in a trade from the Vancouver Canucks on Feb. 27. The Senators took an early 2-0 lead on goals by Brassard and Pageau. Brassard opened the scoring with a screened shot at 1:21 of the first period. Pageau scored at 3:25 when he battled in front of the net and got his stick on a shot from the point by Dion Phaneuf. Bergeron made it 2-1 with 1:33 left in the first period when his shot from the slot went in with Marchand providing a screen in front of Anderson. Brassard got the Senators off to a good start when he finished off a good individual rush by chasing down a rebound and threading a shot along the ice between Rask’s pads to make it 1-0. With the Senators leading 2-1 early in the third period, Senators forward Zack Smith sent Hoffman away on a breakaway down the left wing, but Rask stopped his hard shot from above the hash marks with his blocker at 1:47. Hoffman showed his ability to score from long range when his slap shot from the left point went in past a screened Rask, who had Bruins defenseman Brandon Carlo and Senators forward Mark Stone battling in front of him. Pageau played a strong game at each end of the rink, scoring his seventh goal and going head-to-head against Bergeron. Pageau had a couple of big hits, one on Bruins defenseman Torey Krug in the first period and another on Pastrnak in the Senators zone in the third. The Senators have won three games in a row for the first time since Jan. 17-21. … The Senators were 3-0-0 on their homestand. … The Bruins scored on their only power play. … Bergeron led the Bruins with 10 shot attempts. … The Senators and Bruins play two more times in the regular season (March 21 and April 6 in Boston).